Norwich City Hall, from Gentleman's Walk. Photo taken with kind permission of Caffè Nero. 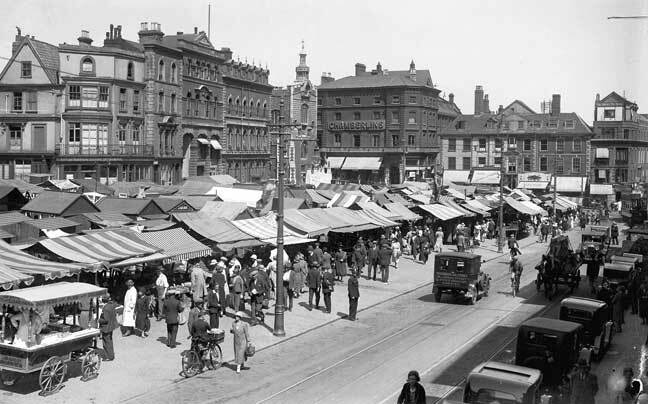 Norwich Market as it was in 1930. Photo: Archant Norfolk. One of the pair of bronze lions which flank the main entrance to City Hall. The building in the background is the Guildhall. King George VI and Queen Elizabeth arriving to open City Hall, 29 October 1938. Photo: Archant Norfolk. 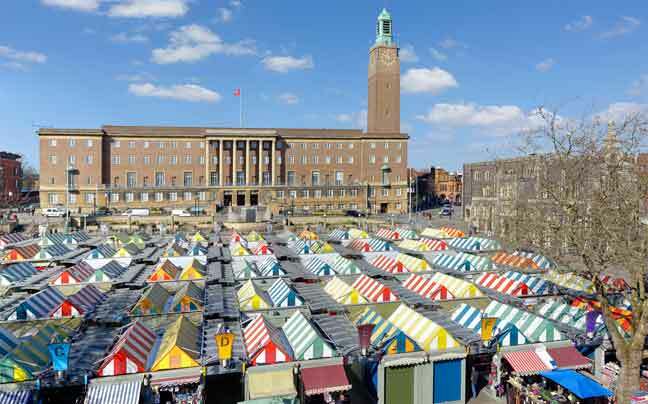 Norwich City Hall was opened in 1938 and is considered to be the finest municipal building in England to have been constructed during the inter-war period of the early twentieth century. For the previous five hundred years the city's administrative departments had been based at the medieval Guildhall, which was built in the years immediately after Henry IV's civic charter of 1404 which endowed Norwich with the status of a county in its own right, giving it greater autonomy from the county of Norfolk. By the start of the twentieth century many of these departments had grown in size and new ones had been added, and the Guildhall was no longer sufficiently large to contain them all. Several had already overflowed into an assortment of rooms in a number of mostly late-nineteenth century buildings which stood to the west of the market place, with a frontage running southward from the Guildhall roughly along the line of what is now the Remembrance Garden, just in front of today's City Hall (see the old postcard elsewhere on this page). In the years which followed, the City Corporation set about acquiring these properties with a view to demolishing them to make space for the building of a new, purpose-built civic centre which would allow all administrative functions to be brought back together under one roof. In 1928 the City Corporation sought the advice of RIBA, the Royal Institute of British Architects, to help formulate the plans, and subsequently the architect Robert Atkinson, already known for his stylish Art Deco designs, was appointed to supervise the project. Atkinson drew up a basic layout and floor plan, and in 1931 he and the City Corporation ran a competition to attract more detailed designs, with Atkinson himself as the sole judge. There were 143 entries, with the winner being a newly-formed partnership of two already well known architects, Charles Holloway James and Stephen Rowland Pierce. Progress towards commencing the construction of the new building was slow, however, due to a protracted planning stage and the financial constraints brought about by the Great Depression, and the foundation stone was not laid until the September of 1936. Only the finest of materials and the highest standards of craftsmanship were used during construction, with great attention to detail – even down to the individual bricks, which were specially made two inches longer than the standard to better reflect the shape of the building. 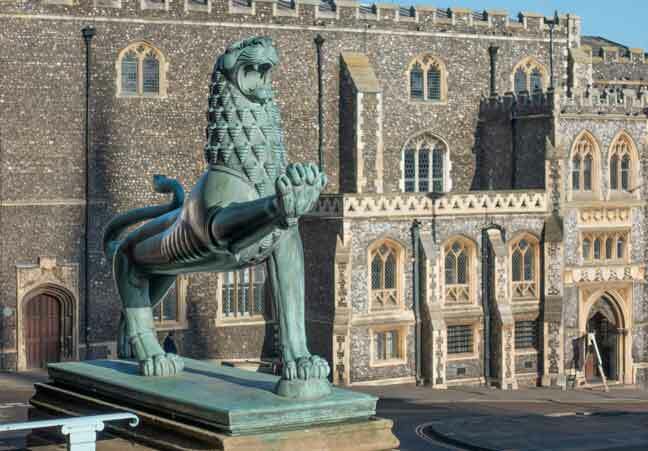 The imposing main entrance, beneath a portico with six polygonal columns, is flanked by two lovely bronze heraldic lions, designed by sculptor Alfred Hardiman. His colleague, James Woodward, designed the three pairs of bronze doors decorated with roundels of designs in relief sculpture, three to each door, depicting scenes from the trades, industries and history of the city. Click here to view a slideshow of the main entrance, the doors and all 18 roundels. The building's frontage is 280 feet (85 metres) in width, with a balcony of some 200 feet (61 metres). The clock tower, which rises to 206 feet (63 metres) is said to contain the largest clock bell in England. The architecture of the building's exterior was considered to be very modern for its period, and the design was influenced to some extent by the Swedish National Romantic style of many of the buildings of the period in Scandinavia – comparisons of certain features of our city hall are often made with those of Stockholm's Concert Hall and City Hall, both completed in the 1920s. The interior of Norwich City Hall is very Art Deco in style and, unlike many other buildings of the period, still retains most of its original features to this day. The photograph at the top of this page shows the Council Chamber, still as Art Deco today as it was when City Hall first opened, with desks in mahogany, edged with inlays of brass, and seats upholstered in finest Moroccan leather. Click here or on the photograph to view a 360-degree panorama of the Chamber. 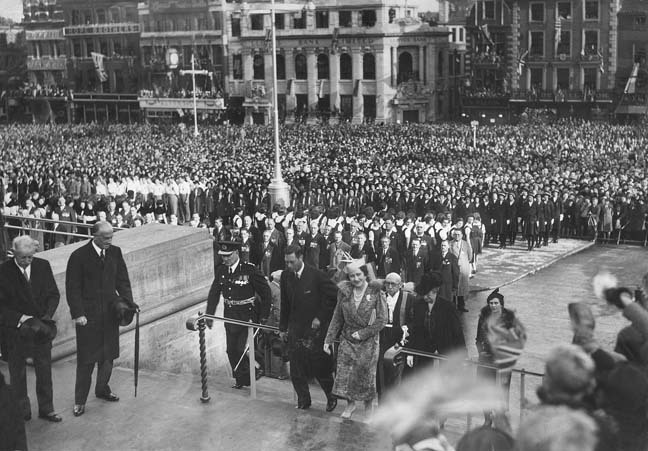 The new City Hall was opened by King George VI and Queen Elizabeth on Saturday 29 October 1938, watched by a crowd which the Eastern Daily Press reported to be the largest the city had ever seen. Within a year Britain was again at war but, although the city suffered extensive bombing, the City Hall survived unscathed. Norwich City Hall is one of the Norwich 12, a collection of twelve of the most iconic buildings in Norwich, with architectural styles spanning the Norman, medieval, Georgian, Victorian and modern eras. Norwich City Hall, from Gentleman's Walk. Photo taken with kind permisson of Caffè Nero. One of the pair of bronze lions which flank the entrance to City Hall. The building in the background is the Guildhall.